While making a financial transaction on secured webpage, you don’t want any accidental click on ‘back’ button. Or the most probable click on mouse middle button may cause your long read document scroll which you don’t want to. In these cases, you want some shortcut to lock keyboard keys or mouse buttons or wheel temporarily. Even while watching a movie on computer screen in full screen mode, we don’t want any accidental click by a friend or kids playing around. [ad id=’7′ style=’float:left;margin:10px 10px 10px 0′]In Windows, one can control the mouse double-click speed, pointer speed, look and feel of mouse pointer etc. from the control panel but can’t lock the mouse clicks once the mouse is connected and installed. There is an option in mouse settings panel as ‘ClickLock’ but that is a totally different feature which allows you to drag or select particular area on-screen without holding the mouse button. Similarly the Keyboard option on control panel is not having an option to lock the keys temporarily. 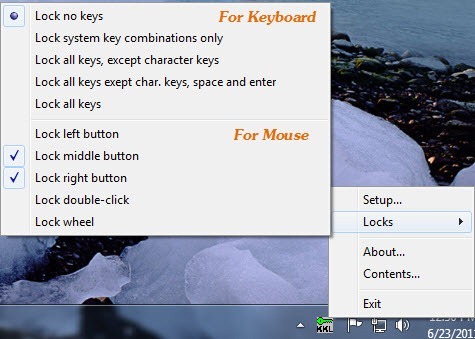 Windows is not having option to lock keyboard and mouse buttons, as this is not an essential or very regular requirement. But if you want to do so for your computer, you can try few freeware which can solve this purpose in no time. I started testing a small freeware named ‘Kid-Key-Lock’. As the name suggest, it is meant to lock the keyboard and mouse to avoid accidental clicks by kids. Anyway, it works in case of adults as well. Once I installed this tiny application (~757 KB), a new item (icon) started appearing in system tray. I clicked on the new icon and a menu appeared. Now selected ‘Locks’ from the small menu and then a sub-menu appeared. Now I can see around ten options to lock keyboard keys and mouse buttons in various combinations. Using Kid-Key-Lock, you can lock or unlock all keys of keyboard, only lock system key combinations (I selected this option and my Print Screen key stopped working till I unlocked the keys). You can also select you keep character keys, space and enter key to keep open while other keys will remain locked. This option will help you in writing something where you don’t want other keys to appear in a document. Similarly, you get option to lock left click, right-click, middle click, double-click and wheel on computer mouse. If you want the selected options to remain active even after restarting the computer, you may select to start this application on startup. What if I locked all keys of keyboard and mouse? While testing or accidentally, if you locked all keys of keyboard as well as mouse and selected the option to start the program from startup. That means, once the computer is ready to operate, your keyboard and mouse are not working. 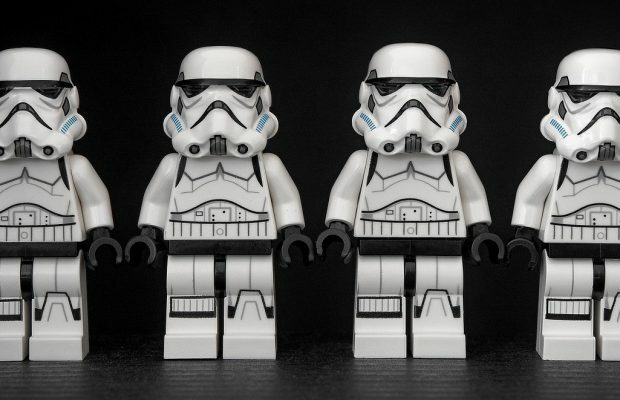 Don’t panic, as you are still the master of your computer. This tiny application provides a preset password to either quit kid-key-lock or to enter the setup and make changes. If you haven’t change the password, the default one is ‘kklquit’ for quitting the application and ‘kklsetup’ to open the setup window to make changes in settings. Apart from ‘Kid-Key-Lock’, there is lot many other freeware application available for this purpose. 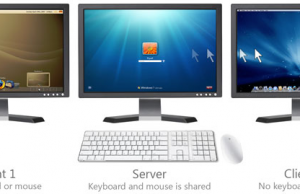 For example, you can also try Key Freeze and Child Lock for locking the keyboard and mouse on your computer. 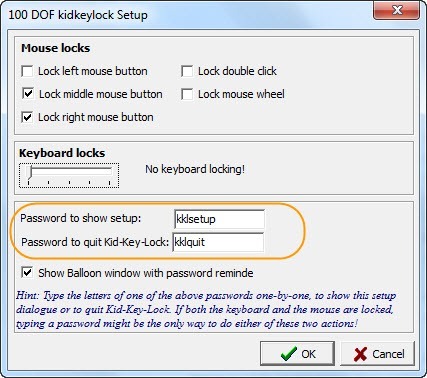 ‘Kid-Key-Lock’ or other software mentioned above works fine for locking the keyboard keys and mouse buttons or wheel, but they don’t lock the mouse movement. For example, if you are watching a movie on your computer screen in full screen mode, you don’t want anyone to move the cursor of mouse that causes the video player’s navigation bar to appear or even in some cases, few more options to come. If you want to lock the screen (specially the mouse movement) of computer but don’t want to see the default lock screen as you want to keep watching the playing movie, you should try ‘TouchLocker’ which is a freeware. Once you will install, you can lock the screen from system tray or keyboard shortcut of your choice and then unlock the same by hitting ‘CTRL+E’ in Windows. You can change the keyboard shortcut and set that as per your choice.